U-factor : When there is a temperature difference between inside and outside, heat is lost or gained through the window frame and glazing by the combined effects of conduction, convection, and long wave radiation. 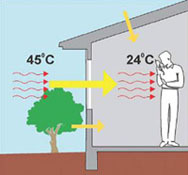 For example; opaque U-value refers to the amount of heat transferred (lost/gain), due to a temperature differential of 1°C between inside and outside, per square meter. Figure next illustrates the concept of U-factor. 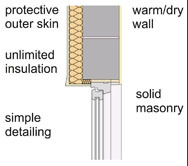 The below descriptions are ECBC recommended thermal mass materials/construction to achieve ECBC recommended U-factor in Warm & Humid climate. 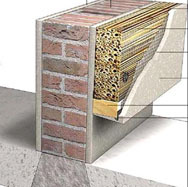 Building Form: Thermal insulation plays an important role in reducing the conductance or U value (W//m2K) of walls. Insulation should always be placed on the external side of the surface. In warm & humid climate, the advantages of placing insulation on the external side of wall composition is that it does not allow the external heat gain or heat loss from the building enabling thermal management of the building. Air-conditioning costs are considerably higher than heating so external wall insulation works equally as well, saving energy costs to cool as well as heat buildings. Energy simulation engine was used to quantify energy saving potential from ECBC compliant wall in a daytime office building. It is observed that, ECBC compliant wall as an individual ECM has energy saving potential, only when WWR is less than 20%. The below graph the reduction in energy consumption in a day time building by ECBC wall as an individual ECM. The maximum U-factor in Day use building is 0.409 (W/m2-ºC) and 24-Hour building is 0.261 (W/m2-ºC) respectively for Warm & Humid climate.